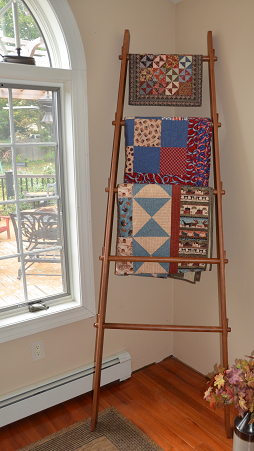 Since the introduction of the Quilt Ladder, many quilter’s have requested an angled version similar to the ladders used to pick apples. The photos are DWR Custom Woodworking’s rendition of the old apple ladder. The Apple Ladder is available with 4,5, or 6 rungs. The spacing is 15″‘, the same as the Quilt Ladder and the rung length starts at 18″ and ends at 30″. The standard lengths are 75″, 90″ or 105″. The rail width is 3 1/2″ and will support the weight of the quilts displayed without bending. The Apple Ladder consists of two upright rails, rungs and pegs. To assemble the Apple Ladder the rungs are inserted into the rails and secured with the tapered peg supplied, making assembly very easy and secure. The 105″ Apple Ladder or Quilt Ladder can no longer be shipped due to high shipping cost. Pickup is still available at DWR Custom Woodworking or any show listed in the schedule.